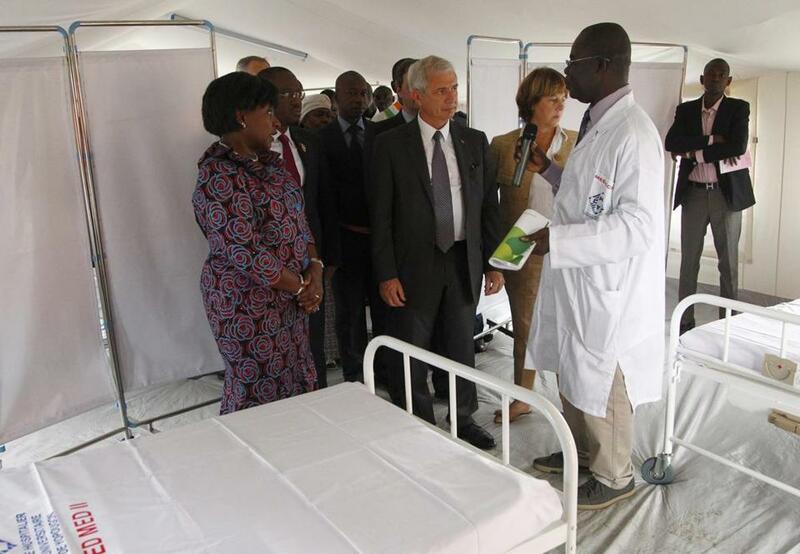 Ivory Coast’s health minister, Raymonde Goudou (left), and a French official toured an Ebola unit Saturday in Yopougon. DAKAR, Senegal — More than 10,000 people have been infected with Ebola and nearly half of them have died, according to figures released Saturday by the World Health Organization, as the outbreak continues to spread. The Ebola epidemic in West Africa is the largest recorded outbreak of the disease, with a rapidly rising death toll in Guinea, Liberia, and Sierra Leone. There have also been cases in three other West African countries, Spain, and the United States. The United Nations health agency said Saturday that the number of confirmed, probable, and suspected cases has reached 10,141. Of those cases, 4,922 people have died. Its figures show about 200 new cases since a report four days earlier. Even those tolls are probably an underestimate, WHO has warned, as many in the hardest-hit countries have been unable or too frightened to seek medical care. A shortage of labs capable of handling potentially infected blood samples has also made it difficult to track the outbreak. For example, the latest numbers show no change in Liberia’s cases, suggesting they may be lagging behind reality. On Thursday, authorities confirmed that the disease had spread to Mali, the sixth West African country affected, and a new case was confirmed in New York, in a doctor recently returned from Guinea. To help fight Ebola, the UN humanitarian flight service airlifted about 1 ton of medical supplies to Mali late Friday. The seats of the plane were removed to make room for the cargo, which included hazard suits for health workers, surgical gloves, face shields, and buckets, according to the World Food Program, which runs the flights. There was concern also in Ghana, where some worried that a strike by health care workers could leave the country vulnerable to the disease. Ghana does not border any country with reported cases, but it is serving as the headquarters for the UN mission on Ebola. In Liberia, the country hardest hit by the epidemic, US forces have been building desperately needed treatment centers and helping to bring in aid. On Saturday, Major General Darryl Williams, who was in charge of the troops assigned to the Ebola response, handed the reins to Major General Gary J. Volesky, commander of the Army’s 101st Airborne Division. ‘‘I’ve been told by a number of people that the task we face is extremely hard. Well, a fairly famous person once said hard is not impossible,’’ Volesky said.